Additionally, with many new features of Veeam, the tape support now includes putting vSphere, Hyper-V, and Veeam Agents for Microsoft Windows and Linux backups on tape. One of the most popular choices for backup archival is tape. It is cheap, reliable and offers protection against crypto viruses and hacker attacks. Additionally, it’s offline when not in a tape loader. With Veeam, IT administrators can use flexible options to create copies of backups and store them on a different media, following the 3-2-1 Rule for the backup and disaster recovery. This blog post provides advice and considerations that will help you create a robust tape archival infrastructure. It is recommended to configure the tape library for use exclusively by Veeam Backup & Replication. Using it together with any third-party tape-recording software (for example, in your evaluation lab) may prevent other software from recording. To streamline the workflow, use tapes with barcodes. Please check the integrity of the barcodes before you start using the tapes, and make sure the barcode reader is turned on. If you have multiple libraries, ensure that the barcodes are unique throughout the infrastructure. For increased capacity, use the latest LTO. Since Veeam Backup & Replication 9.5 Update 3, Veeam now supports the LTO-8 format. If you plan to use encryption for archived data, consider using hardware encryption (implemented in LTO-4 and later). Software encryption can decrease performance. Do not use hardware compression with compressed Veeam backups. Double compression will not give any benefits and can even increase the size of the file on tape. The latest drivers for your tape library. Remember that only the original (OEM) drivers are supported. Drivers supplied with Microsoft Windows are not recommended. The latest changer and controller firmware. Changers working via SCSI are supported. This should be a physical machine or a VM connected through iSCSI, since direct pass-through is not supported. Using a Windows 2008 R2 machine for a tape server is not recommended due to the possibility of performance degradation. Instead, use Windows Server 2012 or later to achieve better performance and seamless operation. Best practice is to provide a direct connection from tape server to the repository to improve the performance and specify this preferred repo in tape server connections. If you plan to create synthetic backups, using a deduplication storage is not recommended. If you plan to perform file-to-tape archiving for a large number of files (more than 500,000 per job), consider using any commercial edition of SQL Server for Veeam configuration database to support these operations. Configuration database stores information about all files backed up by Veeam Backup & Replication, and using SQL Server Express edition (with its 10 GB limit for a database size) may lead to significant performance degradation. If database size reaches 10 GB, all Veeam operations will stop. To load or get the tapes from the library, use the import-export slots. If you need to perform these operations manually, remember to stop tape jobs, stop tape server, perform manual operation, start server, rescan or run inventory for the library (to recognize the uploaded tapes) and then restart the tape job. If the tapes have barcodes, then you can perform the rescan. If the tapes do not have barcodes, then you should perform the inventory. 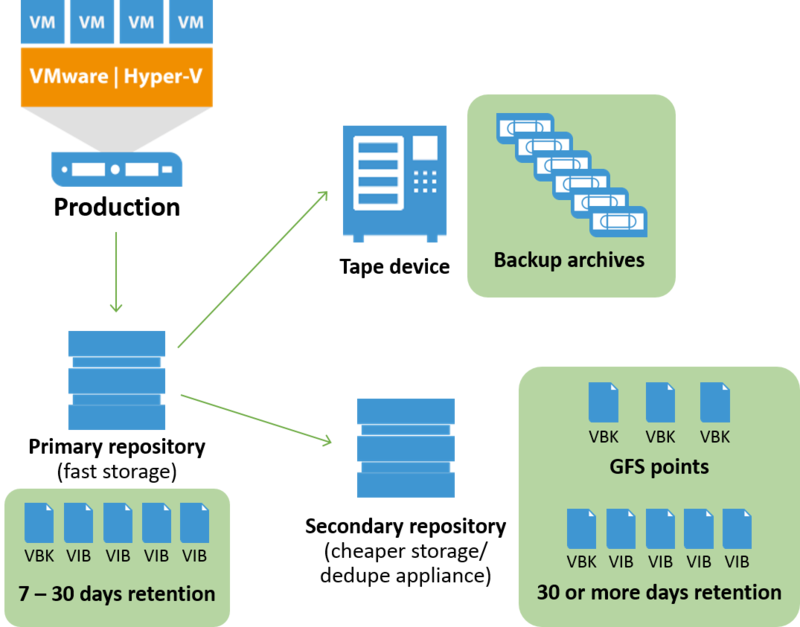 Note: For more information on tape infrastructure and operations, refer to the Veeam Backup & Replication User Guide for VMware or Hyper-V. If you are upgrading your Veeam deployment, then you should first upgrade the Veeam backup server. The tape server will be upgraded after that, using the automated steps of the Upgrade wizard that opens after the first launch of Veeam Backup & Replication console. However, you can choose to upgrade it manually by starting the Upgrade wizard at any time from the main Veeam Backup & Replication menu. 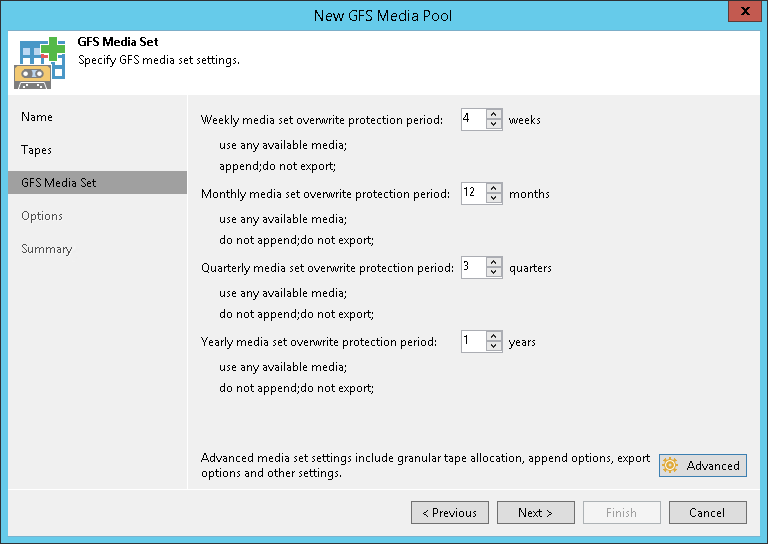 To streamline the process and skip the catalogue step, you can add the new library to the existing media pools, and after the old library is switched off, remove it from the media pools. After connecting the new library to Veeam server, you should load the existing tapes with their barcodes to that new library and perform the rescan. Then you can switch the old library to the offline state (detach it from Veeam server) and then delete it from Veeam Backup & Replication configuration. What entities will you need to archive? Will these be files and folders, or VM backups? Do you need to archive full backups only, or both full and incremental backups? What is the estimated data size? How often will you need to archive data? What will be the retention policy for your data? How often will the tapes be changed? Will they be exported? What is the tape capacity? What tape device will be used for archiving? After these considerations, it is recommended that you double your estimated number of tapes when planning for the resources. In this blog post, we’ve talked mainly about tape infrastructure. We recognize that when setting up tape jobs, the learning curve can be quite steep. Instead of explaining all the concepts, we chose a different approach. We’ve prepared a list of settings and a well-defined result that will be achieved. You can choose to use them as they are or as a basis for your personal setup. Check out this Secondary Copy Best Practices Veeam guide for more details. Evgenii Ivanov is a Tier 1 team leader for Italian and Spanish speaking support teams. Apart from managing his team, he is passionate about knowledge sharing and is involved in mentorship and writing of technical articles, both for internal and public use.